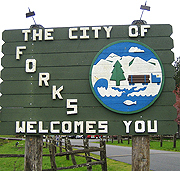 Forks, Washington, officially became a town in 1945. Located about as far north and as far west as you can get in the continental United States, the sleepy little town is three square miles, with a population of just over 3,000 people, and has historically been known for logging, its proximity to the stunning Olympic National Park, Ruby Beach and Hoh Rainforest, fishing, rain, and not much else. All that began to change in 2005 when a Mormon mother named Stephenie Meyer published the first in a four-part series of books about a teenage girl named Bella who moves to Forks to live with her father, and quickly falls in love with a vampire named Edward Cullen. The idea for the story came to her in a dream, she said. She sent 15 letters to potential publishers, with 14 coming back negative or not at all. The15th response was positive. Now picture a match lighting one end of a fuse. Picture the stick of dynamite being the unsuspecting town of Forks at the other end, its residents going quietly about their lives. Picture the spark travelling rapidly nearer. And then - explosion. Meyer's Twilight series - Twilight, New Moon, Eclipse and Breaking Dawn - caught on with a fervor not seen in the literary world since a certain boy wizard hit the stands. And no fans are more devoted, passionate, rabid and possessed than teenagers (teenaged girls particularly) - Meyer's exact demographic. So what can a bestselling, smash success book do to a town, we wondered? In the case of Forks, the town overnight went from being a quiet, small fishing and logging town to being a major tourist destination. Since the publication of the Twilight series, the town has enjoyed a 600% increase in tourism, with an estimated 8,000 visitors per month tromping through, hoping to catch a more serious case of Twilight fever. But those are just statistics. I set out for myself to see firsthand what Stephenie Meyer had done to Forks, and whether it could ever be the same. I knew that towns where books were set still made reference to, or honoured, the stories and authors. Salinas, California, still showcases the places John Steinbeck lived, worked and wrote about. Eastern Canada's Prince Edward Island attracts Anne of Green Gables fans and celebrates much to do with Anne and her creator Lucy Maud Montgomery. But in the case of Forks, I don't think I was adequately prepared. My boyfriend is a good sport. He has never read the Twilight books, nor are they of interest to him, but he was more than happy to let our relaxed celebration weekend double as an investigative exploration into the effects of popular, fictional vampires on a small town. First, I should mention that when we booked our suite at the Bed & Breakfast, we did not realize it was also billed as "The Cullen House" and was in fact a stop and photo opportunity on the (many, frequent) Twilight tours offered by Forks Tourism. The Bed & Breakfast itself is a beautiful old house, built in 1916 and next to gorgeous pastures and farms. 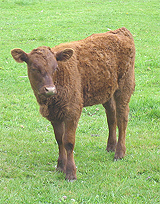 We took many photographs of cows, being the embarrassing city slickers we are. When we climbed the steps to the porch, the first thing I noticed was a sulky, pale face brooding at us from the front window. A cardboard cut-out of Edward. Here we go, I thought. We were welcomed in by Michelle, the temporary operator of the Inn while its owners/proprietors Bill and Susan were away for a wedding. She showed us around, and I made a mental tally of Twilightery. Twilight pamphlets. Cardboard Edward cut-out. Kitschy note from Carlisle and Esme Cullen (the patriarch and matriarch of Twilight's vampire family) apologizing for their absence. Twilight books. Twilight DVDs. Board games. Trivia. In the rooms, the do-not-disturb and maid-service-please signs were laminated with Twilight characters. The rooms come with hangers for the outside doors, allowing guests to declare whose room they wished to be occupying: "Edward's room", "Alice's room", "Rosalie's room", etc. How strange to be in the middle of a rural community and be immersed in teeny-bopper pop culture references. Still, the inn managed a tasteful balance, which must have been hard to achieve. Enough fun Twilight nods to satisfy even the giddiest of fans, while still being a serene refuge for regular folk, too. Whirlpool tubs, gas fireplaces, luxuriously comfortable beds with excellent bedding, and full farmhouse breakfasts. And of course, the resident cat, Tunny, who seemed blissfully oblivious to the hubbub and game to be scratched. The town was a different story, and something of a bleak and depressing one. It is a very, very small town. There is one traffic light. No cinema. There used to be one, as evidenced by the boarded up façade. We found one listing for a bookshop, but the number was no longer in service. There was a public pool that opened, but it closed. What Forks has in spades is Twilight references. More than I could have imagined. There is a store called 'Dazzled by Twilight', devoted to the series, and then one block away, another 'Dazzled by Twilight' store. You could stand in front of one, throw a rock, and hit the other. There is a store called 'Native to Twilight' which, instead of cashing in on the vampire angle, seems to be trying to draw people in with the appeal of the Native American aspect of the Twilight books by carrying both Twilight merchandise and a lot of Native American art, supposedly by local band artists. Motels mention Twilight in their signs. The burger joint has a Twilight-themed "Bella Burger". The restaurant at which we ate dinner had a Twilight trivia sheet on the table (difficult, too). There are tours of everywhere from the police station (where Bella's father, Charlie Swan, worked in the books) to the Cullen House and more. The town seems to be all-aboard the Twilight train, cashing in wherever possible, whether it makes sense or not. My favourite sign was in the window of a pharmacy, declaring that inside was "Bella's First Aid Station". There was also "Bella's firewood". You can't blame the city planners for maximising their 15 minutes to the fullest possible potential, particularly in times that for most people have been economically very difficult. The logging industry has suffered dramatic changes and setbacks over recent decades, and the small town of Forks has to be eternally grateful for the tourism dollars pouring in, even while many probably wish they could go back to normal life before Bella, Edward and Twlight became the food they eat, the water they drink and the air they breathe. We found it encouraging to read the journals in the rooms at the Bed & Breakfast (a lovely touch). It has been in operation for 20 years - 15 years before anyone had heard of Twilight. The earlier pages of the journals mention hiking and fishing and swimming. They talk about the lush, rural landscape, the open, friendly warmth of the people in Forks and the beautiful drives to magical green places. Will Forks have enough charm, friendliness, fishing and natural beauty to remain on the map? Or will the departure of the vampires leave a ghost town behind? This beloved, Canadian classic is set in the tiny Canadian province of Prince Edward Island. Legendary novel set in fictional St. Petersburg, based on Twain's childhood home of Hannibal, Missouri. Set in Alice Springs in the Northern Territory of Australia. Set in the southern U.S. city of Savannah, Georgia. Set in part on the Greek island of Kefalonia in WWII. Set in the poor, rough parts of Chicago, Illinois where Bellow spent much of his childhood. Set in the fictional Castle Rock, based on an amalgamation of towns in King's home-state of Maine. Austen's first completed novel, set in the town of Bath. The popular series about female detective Precious Ramwotse is set in Gaborone, Botswana. This Edgar Award-winning murder mystery takes place in the town of Sechelt, on British Columbia's Sunshine Coast. The mostly fictional adventures of a veterinary surgeon are set in Darrowby, based on the small town of Thirsk in North Yorkshire. The Nobel Prize-winner's first novel takes place in Višegrad, a small town in Bosnia and Herzegovina. Harper Lee's only novel is set in Maycomb County, thought to be modelled on Lee's birthplace of Monroeville, Alabama. This 2001 worldwide bestseller is based in post-Spanish Civil War Barcelona, Spain. This 1855 novel inspired a developing British seaside village to choose Westward Ho! (exclamation point and all) as its name. Set in "the 5 towns", clearly based on the six towns which make up the modern city of Stoke-on-Trent in Staffordshire. Pulitzer Prize-winner Steinbeck often used his childhood home, Salinas, California, as his stories' settings, incuding in his famous novel East of Eden. Desai's Booker Prize-winning second novel was published in 2006 and is set in the small Indian town of Kalimpong. The fictional town of Casterbridge in Hardy's lamentable 1886 novel is based on Dorchester in Dorset. du Maurier's 1936 novel is set at this real-life pub (and former inn) in Bodmin Moor, Cornwall. Set in the invented town and state of Altamont, Catawba - obviously actually his hometown of Asheville, North Carolina. Pamuk's politically complex 2002 novel is set in Kars, a city in Turkey near the Armenian border. Camus' 1947 tale of medical workers during a plague epidemic is set in the real Algerian city of Oran. Comprised of The Fifth Business, The Manticore and World of Wonders. Set in fictional Deptford, based on real-life Thamesville, Ontario. Have you been to a famous literary locale? Tell us all about it at media@abebooks.com.